The Depopulation of Detroit (1960's – present) – What happens to a city's environment when its inhabitants start to leave? Detroit was once a living, breathing city. 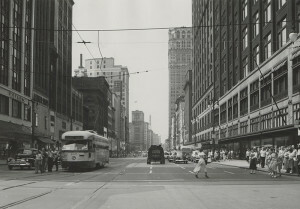 The thriving Motor City was home to 1.8 million people in the 1950’s. However, this was the peak of Detroit’s population. It has been drastically decreasing ever since. Population booms are widely discussed historically, and their environmental impacts are extensively examined. However, what happens to a city’s environment when its population collapses? How are the residents that stay in the city impacted by the changing environment? And can the city’s new environment be used to revive the population? A thorough investigation into Detroit’s more recent history (1960’s – present) can lend answers to these questions. Thesis: The severe decline in Detroit’s population after the 1960’s due to growing racial tensions has left the city desolate and flooded with vacant lots and buildings that have altered Detroit’s environment, both naturally and socially. What happens to a city's environment when its inhabitants start to leave?